Data sheets are a fact of life if you want to dabble in electronics or with electrical devices. You don't have to understand every single parameter for every device either, sometimes you may only need to know the MAX Voltage or Current of a particular device and that will be enough, other times you may need to know a lot more. Knowing a few of the basics in many cases will be all that is required and may keep you out of trouble. I should mention that not all data sheets use the same rules, they can differ widely between various manufacturers. Some think they can use whatever whacky terminology they see fit which helps no one, but in general they try to stick to similar standards. In many cases data sheets are laid out in a similar style, specific to the device being described at the time. I should also point out that Voltages can have various reference symbols which can confuse many novices and some even not so, e.g. Vss, Vdd, Vcc. Also Current is rarely refered to in Amps, it is usually represented as the symbol, capital I. And the same applies to Watts ratings, they are usually represented as the symbol, capital P.
e.g. Ohms Law I = E / R or P = I x E.
Power = P or Watts, mW (and usually refers to the heat dissipated by the device). Power = Ptot = W or mW and usually refers to the total allowable heat dissipated by the package). Listed below are some common symbols and what they may relate to. Gain = Hfe = the Gain of a Bipolar Transistor e.g. 20, 100, 750, Max and Min figures sometimes stated. Gain = Hfe Bias = the amount of current needed (in mA) on the Base Pin to achieve the Gain stated. There are several symbols used to describe Voltages in a circuit or data sheet. In most cases the Vxx symbol used will reflect the device/s being used or described e.g. BJT - Bipolar Junction Transistor, TTL - Transistor-Transistor Logic, CMOS and MOSFET. On a data sheet for a Bipolar Transistor you won't see Vsd or Vgs as a bipolar transistor has no Source, Drain or Gate pins it only has Emitter, Base and Collector pins, Veb or Vce. MOSFET transistors on the other hand do have Source, Gate and Drain pins. To add to the confusion, in Conventional Current flow we say the current flows from POS+ to NEG-, in reality (the real world of Electrons) it is the opposite, electrons flow from NEG to POS. Hence the Drain and Source pins on MOSFET devices are technically correct, which may confuse some. Voltage = Vcc = Refers to a Common Collector Supply Voltage, BJT, TTL Devices. Voltage = Vdd = Refers to Drain Supply Voltage, MOSFET and CMOS Devices. Voltage = Vee = Refers to Emitter Supply Voltages, BJT, TTL Devices. Voltage = Vss = Refers to Source Supply Voltage, MOSFET and CMOS Devices. Voltage = 0V= Can also be the Zero Volt in a Split Rail Supply, e.g. +12V, 0V, -12V. These Voltages, usually in relation to adjacent pins on the same device. Voltage = Vce = Refers to Collector Emitter Voltages (Max Between), BJT Devices. Voltage = Vcb = Refers to Collector, Base Voltages, BJT Devices. Voltage = Veb = Refers to Emitter Base Voltages, BJT Devices. Voltage = Vdss, VDSS = Refers to Drain, Source (Max Between) Voltages, MOSFET Devices. 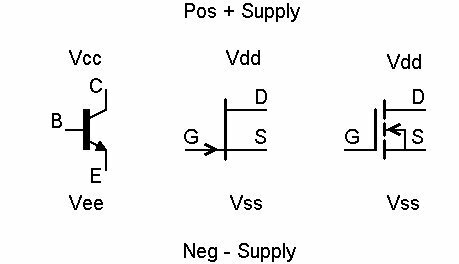 Voltage = Vgss = Refers to Gate, Source Voltages, MOSFET Devices. Voltage = VOL = Refers to a Logic Output LOW Voltage, Zero/Neg/Gnd, Logic Devices. Voltage = VOH = Refers to a Logic Output HIGH Voltage, Pos/+5V, Logic Devices. Voltage = Vrr, Vrrp = Repetitive Reverse or Peak Reverse Voltage, mainly Diodes and LEDs. Voltage = Vf = Forward Voltage, mainly LEDs and @ a specific current, e.g. Vf - 2V @ 20mA. Current = I = Can be in Amps, milliamps mA, microamps �A the UNITS column will tell you which is used. Current = Ib, IB = Usually Base Current, e.g. the MAX the device will handle, BJT Devices. Current = Ic = Usually the current capability of a bipolar transistor, mA up to Amps for larger devices. Current = If = Forward Current capability, usually for Diodes and LEDs. Current = I Quiescent = Standby Current. Power = Ptot = in mW and usually refers to the total allowable heat dissipated by the package). These are just some of the terms and symbols used, there are hundreds of others commonly used by manufacturers, some define the exact same parameters and some are totally unique to a particular device being described. In all cases common sense and a little creative thinking will help you the most if you are not exactly sure what a particular symbol may refer to. In most cases you don't need to know what every single symbol/parameter does or means, use only what you need to begin with and as you become more familiar with everything you can get into the finer details of the devices. Reading data sheets on programmable devices is a whole other ball game again. There you will encounter all manner of symbols for the various other functions and parameters of the device. But if you take every thing step by step you will still learn quite a bit. Don't try to run before you can walk.